The rise of RPA is nothing short of spectacular as the market closes in on $2bn this year. It has captivated the attention of the digital operations executives with the promise of cost-savings beyond labor arbitrage, cost avoidance by extending the life of legacy IT, quicker implementation than traditional IT projects, business-user friendliness, auditability and compliance, straight through processing, and let’s be honest – terrific marketing! 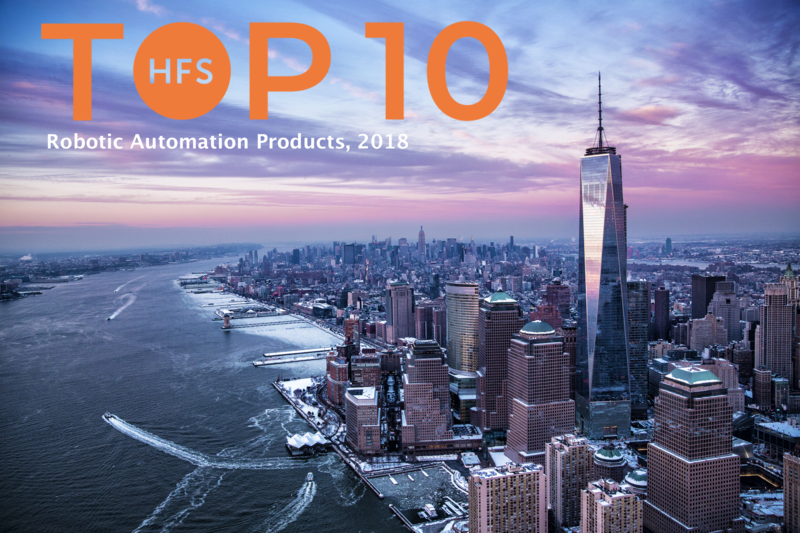 And here is the actual report: Completely free to celebrate our first "HFS TOP TEN REPORT"
However, confusion around RPA deployments is also rife. There are growing questions whether RPA can deliver on the promised ROI and outcomes. Most RPA initiatives continue to be small and piecemeal. Truly scaled RPA deployments are rare. The industry is still struggling to solve challenges around the process, change, talent, training, infrastructure, security, and governance. Overall RPA Client Experience has been 'Good.' The aggregated average CX scores across all assessment dimensions is three on a scale of 4 implying a good overall experience. For most clients, RPA has created value in addition to reducing costs (just not as much and as fast as they heard in the first sales pitch!). For almost all the RPA products assessed, security, controls, accuracy, integration, and out-of-the-box functionality performs as promised. Basically, RPA works! Getting RPA “production ready” is not as easy as promised. The client experience with the amount of coding/configuration required is rated amongst the lowest. Management of version control and upgrades as well the training and support offered by RPA providers was also sub-par. The primary reason behind this is a classic expectation mismatch – the RPA providers oversold and overpromised, raising the client expectations beyond normal, that then resulted in less than required client investments towards process and change management. The disappointment associated with RPA is not about the technology itself. A few surprises here, Thoughtonomy at No. 4 and not finding AssistEdge in the Top 10. 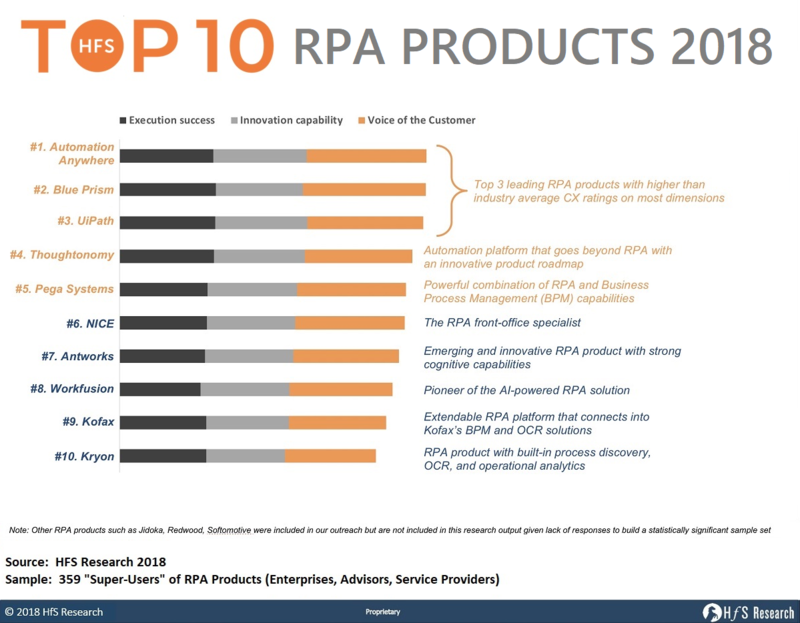 I am eagerly waiting for a similar ranking of Top 10 RPA adopters. Interesting about RPA success mostly piecemeal. Does the industry need to get better at linking the benefits through to end-user CX rather than just focus on quality/efficiency/cost out? Then it’s more encompassing and compelling for a CEO to convince board of that RPA opportunity deserves to transformational rather than piecemeal? Thank you for interesting report. One thing which might be in the interested of others too. How do you see the joint future of the RPA and the test automation tools ? I would assume that there could be synergies found with these to technologies. Great piece! Ever since I started my work at AA Japan office, this site turns to be super helpful. To be honest, as someone who works in AA, I tend to have a more bias view. Posts like this, and through talking with consultants who have experience deploying different software helps a lot! Thank you! The link to the free report shows 404 Error though.... Anyone has the same problem?